A health savings account usually supplements one's current insurance coverage, although with some HSAs you don't have to have insurance coverage. These types of health savings accounts pay for medical expenses that your health insurance coverage typically does not pay for. Depending on the plan you choose, the money in an HSA is deposited either by you or an employer before it is taxed so it's like paying for out of pocket medical costs tax-free. In addition, with some plans, you can earn interest on your money while it is sitting there waiting for you to use it. 1. You and/or an employer put money into your HSA account (the account can be set-up through your employer as a benefit or you set up an account through a private company like an insurance company). 2. Your money sits in the account like it would in a bank account, except the money was placed in there tax-free and will may earn more interest than in a bank account. 3. 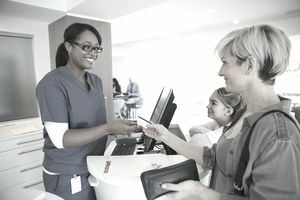 When you need to use your money (you need to pay for a prescription, dental check-up, or co-pay on your current insurance) you may be provided a debit card to pay for the expenses automatically or your plan may require you to send them a copy of the receipt and they will reimburse you with the money in your health savings account. Which Health Savings Account Work Best With My Health Insurance Coverage? Who qualifies for an HSA? Anyone with a high deductible health insurance plan including self-employed persons. What qualifies as high deductible is determined yearly. What medical costs are covered with an HSA? Medical expenses not reimbursed as defined by the IRS, COBRA health insurance payments, some long-term care policies, and health insurance premiums while receiving unemployment compensation. Do I have to have health insurance to have a HSA? Yes, you need to have a high-deductible health insurance plan to qualify for a HSA. Who Can Contribute Money to my HSA? Your or your employer. When Can I Use My Money? You can use your money any time for qualified expenses. Do I Lose My Money? No, it's your money and it stays in your account year after year. What are the Tax Savings? Your money goes into your account before it is taxed. How Do I Start a HSA? First, see if your employer offers contributions to a HSA (don't get this confused with an employer-sponsored FSA-see below). If they do then they can give you the information to set-up an approved account. If they do not, contact your health insurance company or a bank about how to set up a HSA. They will let you know if your health insurance plan qualifies (must be high deductible) and take you through the process of setting up your account. Who qualifies for an FSA? An employee of a company that provides a flexible spending account. What medical costs are covered with an FSA? Medical care expenses that have not been reimbursed as defined by the IRS. Who can contribute money to my FSA? You, your employer or both of you. When can I use my money? You use your money anytime. With an FSA, you determine how much money you would like deposited each year and you can begin to use that money at the beginning of the year even if the contributions have not been met yet (contributions are usually spread out throughout the year as a payroll deduction). Do I ever lose my money? Yes, any unused funds that you do not use in a given year are not available the next year so with a FSA it is important to plan how much money you want to contribute ahead of time and not contribute too much. What are the tax savings? Money is placed in a FSA before it is taxed. Can I take an FSA with me from job to job? No, once you leave your employer you cannot keep your money, but you will not have to continue making your payroll contributions. How Do I Start a FSA? Contact your employer to see if they offer a FSA. What medical costs are covered with an HRA? Medical expenses that have not been reimbursed as described by the IRS. Do I have to have health insurance to have an HRA? That is decided by your employer. Who can contribute money to my HRA? Again, that's up to your employer. When can I use my money? Usually after your account is set up by your employer. Your employer will determine when you are eligible for the account. Do I lose my money? Again, that is up to your employer. What are the tax savings? If you contribute to the account your money will be tax free. Can I Take an HRA with Me from Job to Job? Again, that's up to your employer. How do I start an HRA? Contact your employer to see if they offer HRAs. If they do not and you would like your employer to offer one you can encourage your employer by letting them know that it is a tax benefit for them and it would be a great employee benefit to help curb health care costs for their employees.